Hi, welcome to the Supernova PC Repair Technology Blog, I will try to keep this page updated regularly with interesting Science & Technology news both in the world of computing and beyond! The website is still under development and at present does not have the functionality to leave comments on the articles however feel free to share and like/follow using the social media buttons on each page. 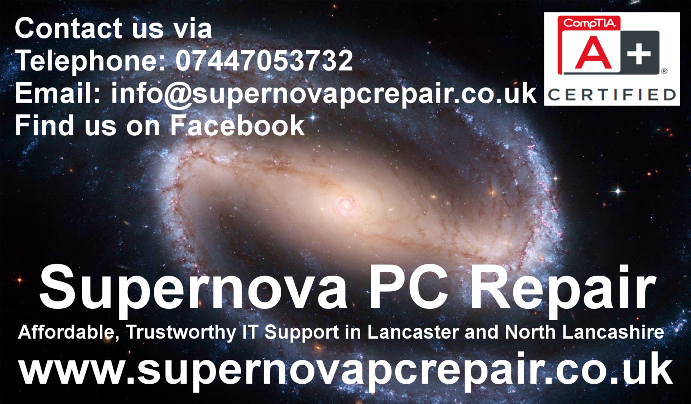 If you have a topic you would like me to talk about in the blog please send us an Email to info@supernovapcrepair.co.uk and we may cover it at some stage.